Facebook’s Having Some Issues With Twitter Cross-Posting, But Nobody Cares. For Reasons. As The Next Web reported users are finding that their Facebook status messages aren’t being cross-posted to Twitter even though they’ve set up their accounts to do so. I first noticed this the other night, but thought nothing of it, since I’m not really a fan of cross-posting. Think about cross-posting for a minute. What purpose does it really serve? Is it convenience? Consistency? Laziness? I think it’s the latter. That’s not to say that posting certain things from one place to another doesn’t ever make sense. In the case of Instagram, it makes complete sense to take a piece of media like a photo and share it on Twitter or Facebook automatically or with a few extra taps. Same with Foursquare. However, when it comes to cross-posting between social networks like Twitter and Facebook, I find it to be an infinite loop of craziness. The idea of Friendfeed was that it was supposed to allow you to pull in ALL of your things from every site on the Internet. Your followers/friends/family could then go to the site and see it all in one place. Pretty smart. Until other cross-posting started. Soon, I saw someone post something on Facebook that got sent to Twitter and it would appear twice on Friendfeed. 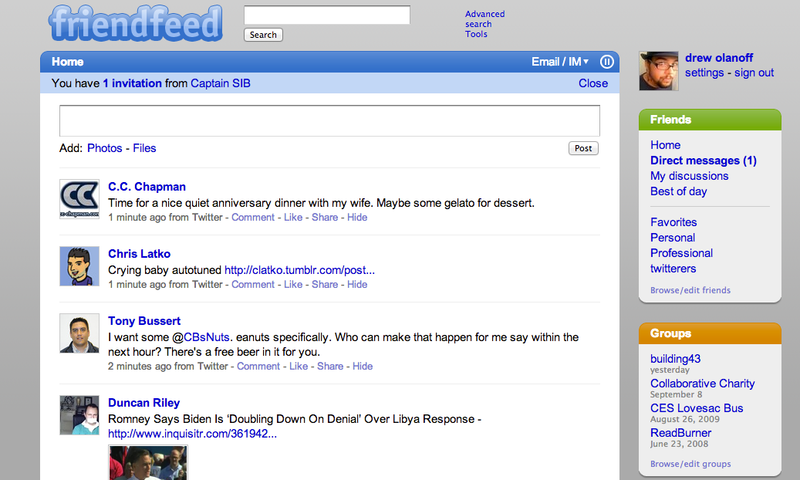 It was like some weird statusception infinite loop that made Friendfeed noisy and ultimately unusable. There is nothing more maddening to me lately than seeing a funny tweet on Twitter, favoriting it, then heading over to Facebook later and seeing it in my News Feed, marked as “via Twitter.” It’s so silly to me, so lazy looking and very noisy. I understand that not everyone feels the same way as me, but I honestly believe that cross-posting can be the devil. It kills creativity, it kills your thought process and it’s not enjoyable for your friends and followers, which is the point of using social networks. When I’m on Twitter, I tweet. When I’m on Facebook, I post a status update or other media. Why should I place the same things on both networks? And automatically, to boot. It seems like overkill to me, so that’s why I didn’t get upset over Facebook’s bug. I really believe that TechCrunch has the best community of readers and tech enthusiasts on the planet, which is why I now work here. Our tipsters are the best in the business, and I have to be honest with you…nobody sent this particular Facebook/Twitter issue to us. That alone is very telling. It’s telling because this is clearly a feature that only early adopters and geeks tend to use. Either that or it’s someone who doesn’t really understand how to use the tools we have at our disposal on the web. Every person that I talk to about cross-posting says that even if they do it, they feel guilty about it, for the reasons that I’ve shared. So, I don’t hide the fact that I really appreciate Google’s approach to social with Google+. One of my favorite features is actually the lack of a particular feature, and that’s cross-posting. You see, Google+ hasn’t exposed write-APIs for developers to start pumping things into the streams of your circled friends. And that’s a good thing as far as I’m concerned. Once content starts getting pumped in blindly, you lose the essence of the experience of the network that you’re on. For example, Twitter is 140 characters, and Facebook isn’t. Why should I read 140-character tweets on Facebook and have to click links within tweets back to Facebook? It’s a joke as far as I’m concerned. I could be wrong. It happens a lot. All I know is that I respect the framework of the network that I’m using, and I feel like I’m doing it, and my friends, a disservice when I force things into it that don’t belong. This is exactly why Twitter is showing embedded photos and videos, so you don’t have to leave the service that you’re currently using. I’m fine with posting blog posts, videos, photos and links to other things. But think about it, when you click “Like” or “Share,” you’re taking an explicit action. An extra step. Cross-posting is automatic. Having said that, it’s really just the copycat nature of cross-posting that makes me sour. Very sour.